This book requires a serious time commitment. Grant lived 132 years ago, not so long in the course of things. Much had been written about him at the time, and much after. He himself wrote memoirs that are highly regarded and that showed his intelligence and shrewdness. His mother-in-law Dent, defender of southern slave holdings, noticed that although he had failings (alcohol) and could sometimes get off-track career-wise (an inability to make money as an independent entrepreneur), he had a fine political mind. That his mother-in-law had such good things to say about his instincts speaks to his political successes. The cover copy says Grant was unappreciated for much of his career. This should give succor to individuals who struggle through various jobs, unable to find something in which they can excel. Grant went to West Point almost by accident, disliking the jobs assigned him by his father, a tanner. He apparently hated the smell of the tannery and warm blood, and found himself unable to eat meat unless it was charred beyond recognition. His horsemanship was legendary, even from a young age, and the skill served him well throughout his military career. His career stalled after a stint in the Mexican War, and revived during the Civil War when he could showcase his particular skills in strategy and logistics. The book cannot adequately be recapitulated in short form, so I resort to impressions hammered home by Chernow in a thousand examples: that Grant decided to trust certain people whether they were knaves or not. He tended to hold onto his initial impressions even when he had reason to abandon support for individuals who’d done him wrong. It strikes me that this failing of his, a failing of accuracy in judgment, could be a reason he as so well liked as a leader. He was loyal, generous, kind, and willing to forgive as well as extraordinarily skilled himself in being able to read a battlefield, the condition of his men, and the heart of the opposition. Grant was not as skilled at the diplomacy he would later be asked to perform in his role as president, though he gave more positions to people of color than any previous government, and he was instrumental in reforming the civil service. I would like to read more about a diplomat that Chernow seems to praise above all others, Hamilton Fish, Secretary of State for the entire of Grant’s presidency. 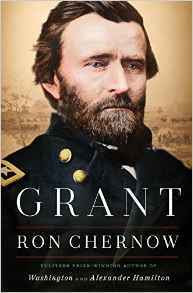 More than anything, Chernow makes clear that Grant’s life, despite the lofty heights of public regard during certain periods, was a real struggle all the way through. Never has a presidency seemed like such a bum job: after having fought a terrible, bloody war on one’s own soil for so many years, Grant had to face the unrepentant vanquished again as leader of a divided nation. The racism and bitterness we see and hear now is a mere echo of what was going on during Reconstruction, when every attempt to raise the quality of life of black people was fought every step of the way. Makes one want to force those who refuse to accept their defeat to their knees now—no more talk, no more accommodation. I wish it were as simple as bringing out the big guns (the law) and ending this. But we see now how deep the sense of entitlement still is. Any portion of this book is worthwhile to read even if you can’t get to the whole thing. It's so important to recall the details of the Civil War and its aftermath now, in this time of division in our own country. If I had my druthers, this book would be shorter. My brain’s ROM has been gummed up with this work for months now and it nearly crashed my hard drive. I feel I am cheating in some way by not being able to express more moments of revelation, but there were so many. I’m sure there is something to be said for putting in every detail of a man and his country, and perhaps it is reasonable to repeat oneself occasionally. Readers may select portions of the whole, or spread out the reading over a long period. However, it is difficult to digest a book of this size. I listened to the audio of this book and looked over the hard copy. The audio was very well read by veteran actor Mark Bramhall, produced by Penguin Audio. Below please find an excerpt of the reading of Chernow’s work by Bramhall.